To the D-School, and Beyond! I'm super excited to be teaching a "PopShop" class on Visual Thinking this winter at the D-School with Alli McKee of Blot, Inc. Our class will be focusing on how Visual Thinking and Communication can play a crucial role in multi-stakeholder systems, and we plan to introduce students to the future of productivity through the use of digital drawing and collaborative tools. We quickly threw together a flyer for potential students to check out for a "pitch night" which you can check out below. 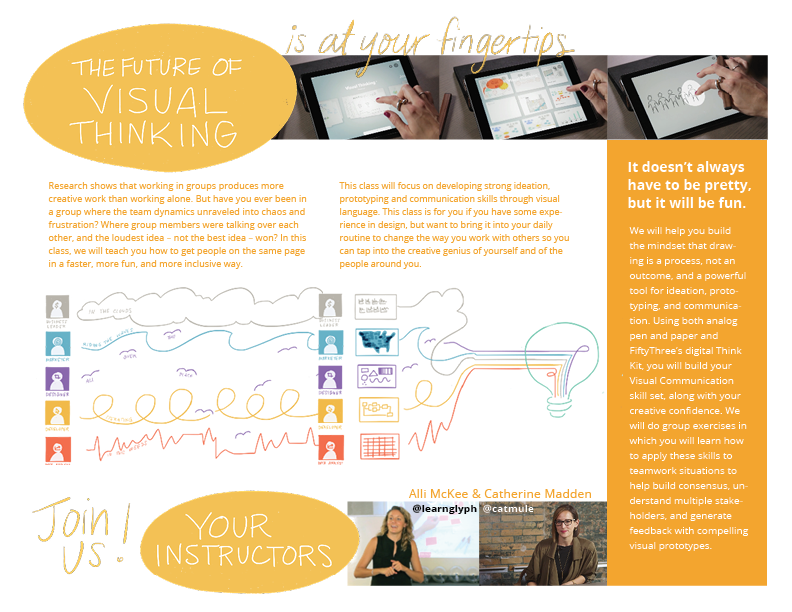 Alli and I are both actively exploring the convergence of technology, design, data, and visual language in our work. Through this class we hope to provide our perspective to get students thinking and working in a new way that enables more productive conversations, fearless experimentation, and confident decision making. If you'd like for us to bring this course to your organization, just submit a inquiry through our work page! Catherine Madden LLC is a creative consultancy specializing in visual thinking and data storytelling.